Latten is a copper alloy that was used extensively throughout the Middle Ages into the late 18th century. It was used to craft decorative details on metalwork, fabricate flatware and livery and as an inexpensive material in the production of finger rings, particularly the widely worn signet ring. 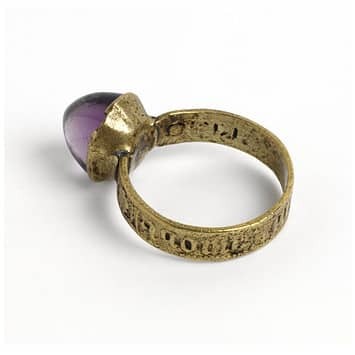 A Latten and Amethyst Ring c.1400. Image Courtesy of the Victoria and Albert Museum.